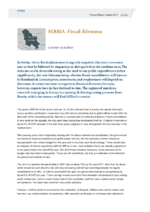 In Serbia, where fiscal adjustment is urgently required, this year’s recession may at best be followed by stagnation or slow growth in the medium term. The risks are on the downside owing to the need to cut public expenditures rather significantly, the sole dilemma being whether fiscal consolidation will have to be frontloaded. Consumption, investment, and employment will depend on that issue. A certain increase in exports to Russia is forecast; this year, however, exports have in fact declined to date. The regime of sanctions currently emerging in Europe is exposing Serbia to growing pressure from Russia, which the country will find difficult to resist.